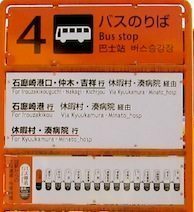 To get to Kisami from Izukyu Shimoda Station you can take a bus from the rotary right outside the station. Look for the big orange signs. 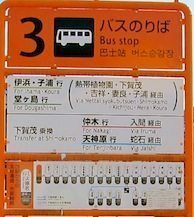 Busses departing from bus stop 2, 3, and 4, all stop at Kisami Bus Stop. 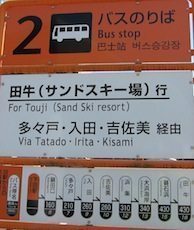 You can walk to Ohama beach and Guesthouse tabi-tabi from there. You can find a map of the area here. The 10 minute journey costs ¥260 which you have to pay when you get off the bus. Don’t forget to grab a ticket when you are geting on, it shows where your trip originated from much like a train ticket. *** Please be aware that the bus schedule can change a few times a year so best to have a look at the schedules yourself when you arrive.